Note: Multi-unit listings work differently than single-family listings. Notification of appointment status (e.g. Unit 1 has confirmed, Unit 2 has declined, Unit 3 has confirmed, so you can only show 2 of the possible 3 units.) will not be sent to the showing agent until all units have provided some sort of acknowledgement about the showing, whether it be confirmation or declination of their request. When an agent schedules an appointment on a muli-unit listing they will only be allowed to request a unit if it is available for the date and time selected. If a unit is not available for the date or time selected a request will not be made on that unit. If ShowingTime still has not received appointment status for any unit and the requested appointment time is approaching, (start of the requested appointment time) then ShowingTime will automatically decline any unresponsive units so that the showing agent is properly notified. This warning will only show if you have a unit which has instructions that have not been completed. Any unit that does not have completed instructions will not be scheduled on, as ShowingTime is not sure how to handle a showing on a unit that has not been configured to completion. This message will not be shown when every unit added to your listing has completed instruction. 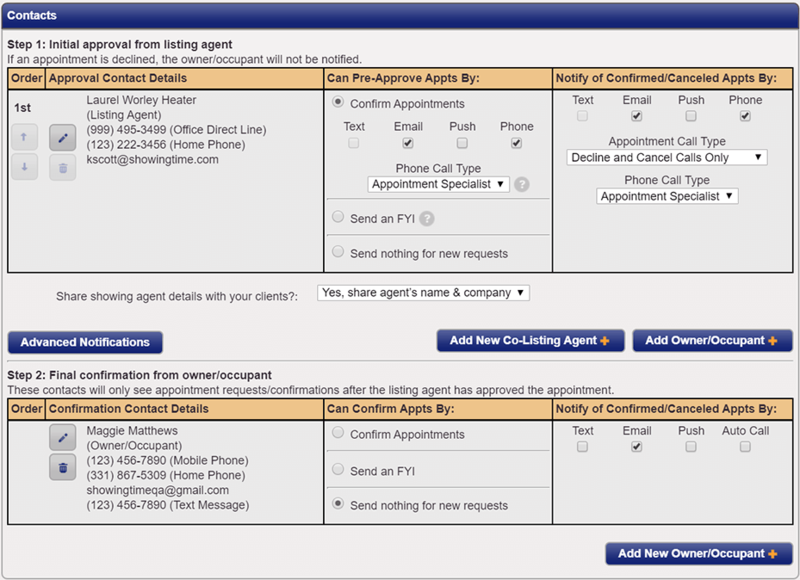 The Appointment Type set here only affects Listing Agents and Owners. Appointment requests will be confirmed when all units have acknowledged the request. In addition to all units acknowledging the request, permission must be obtained from any configured agent or owner. The functionality is much like the "Appointment Required confirm with ALL" option. Notification to the showing agent, of their appointment requests status, will not be sent unless all occupants associated with the listing have provided acknowledgment of their appointment request & any agent or owner configured to be part of the process has confirmed the showing. Any agent or owner configured in this way will ultimately be the deciding factor. If an agent or owner has declined the overall request, signifying that they will not be able to accompany, then the appointment as a whole will be declined. This option should be used for agents and owners who want to be part of the confirmation process and will be there to accompany the showing. This option should be turned to Yes if keys for the building are not located at the listing itself and are located at the listing office or a remote location. Agents who have scheduled appointments through the Appointment Center will be reserved a key if available. Any notes that are staff specific. Information entered in this field is not necessarily required for the CSR to convey to the agent, and will only be conveyed if they have determined it applies. If conveying a note to the showing agent is required, it should be added to "Notes for Showing Agent" section on the unit's worksheet for which it applies. A selection of commonly used notes, ranging from notes associated with pets, access information, or general listing information. Notes can easily be added by selecting the checkbox next to the note. Once all needed notes have been toggled click on Add to populate the notes to that desired section. This warning will only show if the unit your working on has instructions that have not been completed. Any unit that does not have completed instructions will not be scheduled on, as ShowingTime is not sure how to handle a showing on a unit that has not been configured to completion. The Listing Agent will be responsible for confirming or declining appointments for this unit. Other contacts may be added and notified as configured by a listing representative. This is where you add the unit number for the unit you are working on. By default, a unit number will be populated, but unless changed to the specific unit for which the instructions apply, an agent might not know what unit number they can show.